Being a woman can be hard. A lot is expected of us. Not only do we hold jobs, raise kids, and keep a household running, but we’re expected to do it all with a smile (and to look fit and pretty, too!). It can be daunting at times, which is why it’s so important to keep connected to our friends. Sure, your mom and sisters can be a source of support, as can your partner. But there’s something special about friends–the people who choose you to be a part of their life journey–that nourishes the soul and rejuvenates the spirit. 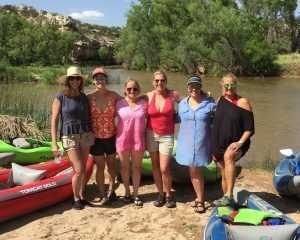 Here are a few of mine on a recent girls’ trip we took to Arizona, where I laughed more in five days than I have in the past month. I can’t tell you how much that hit the reset button on my stress level. Start a book club (or another club involving a mutual hobby or interest, like knitting, hiking, or music). Naturally, talking about books is a favorite pastime of mine, but book club evenings eventually evolve into sharing stories and laughs over wine. What’s nicer than that? Host a potluck. This sounds old-school, but it’s a nice way to host a party without doing all the work and spending all the money. The host can prepare the main dish, but assign others the salad, sides, and dessert (dessert to be given to your most-trusted friend, as it is the most important part of the meal!). Take an exercise class (or meet for a long walk). The long walk allows for lots of catching up, but then again, going to Pilates with a friend makes that endeavor less painful. Watch a series together—literally. When I was young and single, I did this with a friend (Melrose Place, anyone?). More recently, a friend and I did this for LOST and American Horror Story. We’d take turns going to the other’s home to watch, leaving the hubby and kids to fend for themselves for an evening each week. It turned TV watching into a social endeavor, and it was fun to snack away while discussing the episode (my husband hates when I ask questions during a show–and during LOST I had a lot of questions). Plan an “at home” spa day. Drug stores sell a ton of inexpensive face masks and nail products. Pick up some collagen masks, Emory boards, and brightly colored polish and call your friends. You might want to send your partner and kids out to the movies so you have the place to yourself, but it can be fun to engage in these girly activities no matter your age, and you end up feeling fresh and pretty when it’s over. Those are a few of my ideas, but I’m sure there are plenty more. If you have a good idea, please share!